It’s September 2015. Get Your TBR List Ready! Summer is over and my TBR lists are getting shorter. Not my personal TBR list, but the new releases list that I feature here every month on the blog. After looking over my monthly posts, I didn’t read as many as I mentioned but it’s all good. I’m a moody reader and what caught my eye at one time gets put on the back burner for what I am feeling at the moment. This blog and this monthly post is for readers who are not necessarily reviewing. They are just looking for an answer to “what should I read next?” And I’m not getting as anxious about finishing my TBR list these days. I just want options and that’s a good thing. Maybe I am getting more selective in what sounds good to me in new published books. Maybe as the year progresses less “buzz books” are coming out. I don’t really think that’s it either because I look forward to seeing these six on the shelves at the library and in bookstores. Brief synopsis paraphrased or taken from Goodreads. Click on the title for more. Girl Waits With Gun by Amy Stewart (Sept. 1/ 416 p./Houghton Mifflin Harcourt) Constance Kopp is not to be trifled with. She is based on one of the first female deputy sheriffs and while enlisted to help track down a gang of men sent after her family, she must also revisit her past and family secrets. Undermajordomo Minor by Patrick deWitt (Sept. 5/ 352 p./House of Anansi Press) “Undermajordomo Minor is a triumphant ink-black comedy of manners. It is an adventure, and a mystery, and a searing portrayal of rural Alpine bad behaviour, but above all it is a love story.” Does anyone know if you have to read The Sisters Brothers first? The Heart Goes Last by Margaret Atwood (Sept. 29/ 320 p./ Nan A. Talese) Well it’s Margaret Atwood and this one just sounds bizarre and fascinating to me. A couple wants out of their blah lifestyle so they sign up with a social experiment to have decent jobs and a home in exchange for a prison cell every second month. Not a problem until they become obsessed with the other couple who occupy their “normal life” while in prison. I smell reality show copying this one. It’s September. What new releases are you looking forward to this month? 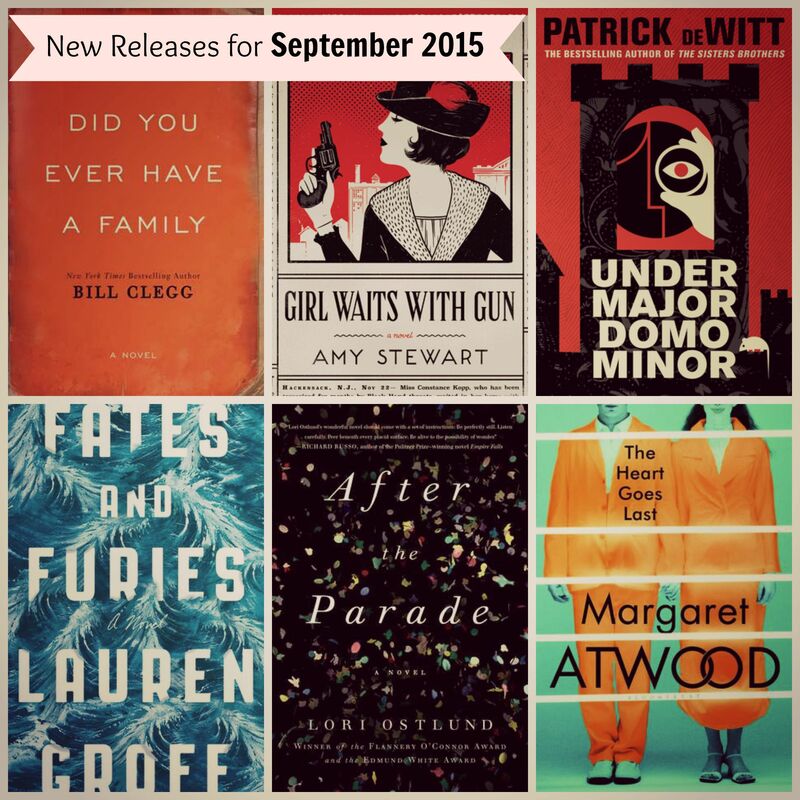 Tags: Amy Stewart, Bill Clegg, Gallery/Scout Press, Houghton Mifflin Harcourt, House of Anansi Press, Lauren Groff, Lori Ostlund, Margaret Atwood, Nan A. Talese, new releases for September 2015, Patrick deWitt, Riverhead Books, Scribner. Bookmark the permalink. I can’t wait to read Did You Ever Have a Family and Girl Waits with Gun as well! And – I’ve already read Fates and Furies…I’m feeling conflicted about it and will have a review up closer to pub date. I agree…after Sept, my ARC review list really dwindles. I have no idea why, but I’m totally fine with it because that gives me time to catch up on all the other great books I missed this year! Did You Ever Have a Family, Girl Waits With Gun, and Fates and Furies are so wonderful! I can’t wait to read the new Atwood. All of these sound great, but I am especially looking forward to The Heart Goes Last, Did You Ever have a Family, and Girl Waits with gun. I think you’re in for some good reading with this list! You do not have to read Sisters Brothers first, but YOU SHOULD READ SISTERS BROTHERS!!! So great. I’m looking forward to that one, too (obviously). I finished Clegg’s and can’t recommend it highly enough. It’s truly living up to the hype. I’m not sure Fates is in my wheelhouse, but I’m still getting curious the more I hear about it. Whether you pick some or all of these up this month I hope you enjoy them! I have four of these on my docket this month, and am pretty excited for all of them. We’ll see if I actually can manage to get to them all this month! I look forward to your thoughts on The Heart Goes Last. I enjoyed Undermajordomo Minor and hope to read Girl With A Gun soon. It’s hard to say I’m “looking forward to” Clegg’s Family because it’s a gut wrencher but it’s getting great reviews so I have high hopes for it. I’m 3/4 of the way through Fates and Furies and while plenty of people I trust gave it 5 stars I’m going to need fireworks to push it past 3. You are so right. I’m almost done with Clegg’s and its brutal. It’s difficult not putting yourself in the story and imagining losing everyone. I’ve taken many breaks. NOT a light read.